For three years, OneAmerica community organizers had been hearing about the fear and mistrust border residents harbored toward U.S. Border Patrol. Residents living in Snohomish, Whatcom, and Skagit counties were too afraid to go to the courthouse to pay a fine, too mistrustful of the authorities to call 911, or too fearful to leave their home to attend church or go to the grocery store. How could they become active participants in their communities if they were too scared to leave home? Organizers interviewed residents in their homes, at work, and in church. We researched and observed how U.S. Border Patrol’s funding soared, its jurisdiction crept further and further inland, and how its role in the community became virtually indistinguishable from local police and 911 emergency service personnel. OneAmerica compiled this research into a report and, in April 2012, released The Growing Human Rights Crisis on the Northern Border, which truly demonstrates the transformation of these border communities in the wake of the post-9/11 buildup of U.S. Border Patrol activity in the area. The report shares the findings from 109 on-the-ground interviews with mothers, fathers, workers, and students. The majority of stories are marked by fear, mistrust, harassment, and abuse. They are rooted in specific—and avoidable—patterns of practice implemented by the U.S. Customs and Border Patrol (CBP), working in close coordination with Immigration and Customs and Enforcement and local law enforcement agencies. First, in its own independent operations, the Border Patrol engages in systematic profiling of religious and ethnic minorities. Second, collaboration between Border Patrol and other agencies, including local law enforcement, emergency responders, and the courts, results in a confusing and dangerous fusion where vital services are perceived as immigration enforcement. Third, these first two patterns result in a third: U.S. Border Patrol’s behavior and dangerous partnerships with other agencies have created extensive fear and mistrust, leading to community members’ unwillingness to call 911, access the courts, and even to leave their house to attend worship services or fulfill basic needs. We believe firmly that we must not trade away our rights for security. Documenting what is happening allows us to educate our policy makers so we can push together to change the situation. Our report offers policy recommendations aimed at correcting these wrongs while still protecting our borders, improving the ability for CBP to carry out its mission, and protecting the safety and rights of all who live in these communities. This report is the product of a unique three-way partnership between OneAmerica, theUniversity of Washington Center for Human Rights, and the residents and leaders of these border communities. It culminates the first stage of a long process of organizing, educating, and empowering northern border communities to defend their human rights. It’s been a busy week! We organized a powerful wage theft action to publically call out the owner of Margarita’s Bar and Grill, Ivan Escalona, for not paying his workers. We brought a lively group of 45 people which included some Occupy Des Moines allies! Ivan refused to meet with us or even a delegation of leaders and would not accept our letter. We got what we came for, though, which was news coverage and a public entrance into this campaign. All three local news channels featured the action on the news on Friday night and the Des Moines Register wrote an article. Next step in the campaign: wait a little while to see if Ivan or more workers who he owes money to call us. We will push for the investigation with the US Department of Labor and put in more complaints against Margarita’s if Ivan refuses to cooperate and change his ways. Here’s a link to CCI’s new website and the news roundup. Also, 15 CCI members attended the Des Moines City Council meeting last night to speak against the ICE detention center and the repeated postponement of the hearing. The City Council heard our frustration with the delay loud and clear and set the hearing for Monday, December 19th. We’re pretty sure that December 19th will be the day! We will meet at City Hall at 4:30 pm and everyone should get ready to give testimony. Finally, we received news from the Polk County Sheriff Department that the Grand Jury hearing on the facts of Deputy Vanhoozer’s alleged assault against three Latino males will be next week. The Grand Jury is not public but we will stay on top of this issue and report back once we have more information. The Sheriff Department is also working on a list of what offenses are or are not fingerprinted for in Polk County Jail so we can educate our members and the Latino community on their rights after the Sheriff’s announcement at our meeting last month. Editor’s note: yesterday, Yahoo!News also ran this article on the effects of immigration raids in Iowa — effects that are still being felt more than three years after immigration officials scooped up 20% of Postville, Iowa’s population in a single day. A large and diverse group of immigrant rights, civil rights and community organizations have signed onto a letter to President Obama, calling for an end to the so-called 287(g) agreement program. As many of our readers know, the 287(g) program allows local law enforcement agencies to enforce federal immigration laws. The program has an extensive record of civil and human rights violations and is the same program that allows Sheriff Joe Arpaio to continue his reign of terror in Maricopa County, Arizona. We applaud your recent remarks acknowledging, that “there is a long history in this country of African Americans and Latinos being stopped by law enforcement disproportionately.” However, DHS’s continued use of 287(g) program exacerbates exactly this type of racial profiling. In light of well-documented evidence that local law enforcement agencies are using 287(g) powers to justify and intensify racial profiling, Secretary Napolitano’s July 10, 2009 announcement that DHS has expanded the 287(g) program to include 11 new jurisdictions is deeply alarming. This quote gets to the heart of the issue with these agreements. We strongly hope that the administration heeds this call to terminate this destructive program. For a full list of organizations signed on, keep reading. And for the full text of the letter, click here. The letter will be delivered this Thursday, August 27th alongside a series of local actions from groups around the country. NC: Protesters Rally Against Immigration Enforcement Program – Activists marching across the state for immigrants’ rights rallied on the steps of the state Capitol on Friday in support of abolishing 287(g), a federal program that allows local law enforcement officers to act as immigration officials. UT: More Law Enforcers Declining to Follow State Immigration Statute – Park City Police Chief Wade Carpenter will not cross-deputize his officers as immigration agents. MD: Assembly Closes the Door on Licenses – The Maryland General Assembly last night passed a hard-fought compromise that would end the practice of issuing driver’s licenses to illegal immigrants, capping a 90-day session in which lawmakers were greatly constrained by the state’s financial challenges but passed numerous low-cost bills affecting residents’ daily lives. CA: Group: Detained Immigrants Kept in Squalid Basement: Immigrants held by the federal government are being detained in a squalid basement where conditions are foul-smelling and dirty, a civil rights group said in a lawsuit. WA: Seattle Raid Raises Questions About Shift in Enforcement: The disclosure Wednesday that illegal immigrants in Seattle were given permission to work in the country has triggered alarms on Capitol Hill that the Obama administration is making a fundamental shift in the enforcement of the nation’s immigration laws. NM: Roswell Hispanics Claim Police Racial Profiling: Roswell residents’ complaints about racial profiling of Hispanics by police officers have prompted a state advocacy group to request intervention from the U.S. Justice Department and the state attorney general’s office. GA: Senate Bill Links Road Money to Immigration Status: Local governments that don’t check to make sure they are not hiring illegal immigrants could lose state money for building roads, under legislation that passed the Senate on Wednesday. Yesterday, the UNC- Chapel Hill School of Law and the American Civil Liberties Union of North Carolina, released a report on local immigration enforcement programs – also known as 287(g) programs. The basic findings of the report are that 287(g) programs have “created a climate of racial profiling and community insecurity” in North Carolina communities. the program encourages officers to target Hispanics for arrest and discourages immigrants from reporting crimes. The report also says that in many cases local agencies are failing to comply with the terms of the agreements they made with the federal government. This is the same program that gives good old Sheriff Joe Arpaio the authority to enforce immigration law in Maricopa County. This is also the same program that has allowed him to spiral into an unchecked, power-hungry, latino-hunting machine, in spite of his atrocious record of human and civil rights violations – not to mention the crimes going unenforced by his agency. Read more about Arpaio here and sign the petition! “We found serious erosion of community trust, as well as legal concerns,” said Deborah Weissman, a UNC law professor who lead the study, in a statement. The 287 (g) program has been known to have this “chilling effect” in communities. Basically, it pushes immigrants even further into the shadows, where they are unwilling or frightened to report crimes – even violent crimes against themselves. You can read the full report from UNC-CH here. 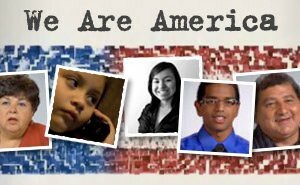 We Are America raises the voice of immigrants in the dialogue around our country's broken immigration system. A story bank of video, audio, photo and text stories tell about real people and what they have at stake as new immigrants to the United States. The Fair Immigration Reform Movement (FIRM) is a national coalition of grassroots organizations fighting for immigrant rights at the local, state and federal level. Learn more about who we are. Click to download "Crossing Borders," a curriculum on building relationships across differences, from our friends at the Black Organizing Project.